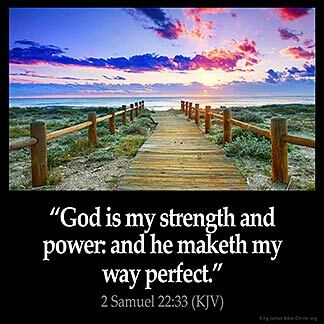 2 SAMUEL 22:33 KJV "God [is] my strength [and] power: and he maketh my way perfect." 30For by thee I have run through a troop: by my God have I leaped over a wall. 31As for God, his way is perfect; the word of the LORD is tried: he is a buckler to all them that trust in him. 32For who is God, save the LORD? and who is a rock, save our God? 33God is my strength and power: and he maketh my way perfect. 34He maketh my feet like hinds' feet: and setteth me upon my high places. 35He teacheth my hands to war; so that a bow of steel is broken by mine arms. 36Thou hast also given me the shield of thy salvation: and thy gentleness hath made me great. "God is my strong fortress; And He sets the blameless in His way. God is my strong fortress, And he maketh my way perfectly smooth. God is my strength For without Him I can do nothing Through and with Him I have His power us working together He maketh my way perfect He has my way mapped out for me and with His help I walk in it His perfect way .